One of the oldest existing Palace built by the Dutch in India, Bolghatty Palace is located in the scenic island popularly known as Bolgatty island in Kochi, Kerala. In 1744AD, Dutch traders built this villa and it was later extended and lush green gardens were landscaped around it. The building was then the Governor's palace for the Dutch and later in 1909 was leased to the British. It served as the home of the British Governors, the seat of the British Resident of Cochin during the British regime. 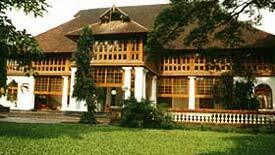 In 1947, when India got her independence, the palace became the property of the state and later converted into a heritage hotel resort and is now run by the KTDC (Kerala Tourism Development Corporation). Set amidst lush, tropical greenery, this prestigious heritage hotel with spectacular scenery of the back waters all around is a place of quiet laid back enchantment. The palace is a two-storeyed building with bath attached well-decorated bedchambers and a huge lounge wherein historical portraits are displayed. The resort offers palace and executive suits, deluxe rooms, honey moon and lake front cottages along the edge of the backwaters for stay. The guests can enjoy a beautiful calm and quite environment which facilitates a mini golf course, swimming pool, Ayurvedic center and daily Kathakali performances. Kochi (Cochin) one of the important towns in South India, is the commercial hub of Kerala state with a natural harbour. This dynamic city known as the 'Queen of the Arabian Sea' has rapidly industrialising suburbs with soaring land prices. 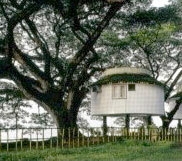 The city has three main parts Fort Kochi, Willingdon Island and Ernakulam. Bolghatty Island which is a long narrow peninsula, is situated at the opposite side of the Ernakulam jetty across the backwaters. Frequent boat service is available from the mainland, Ernakulam to the Bolghatty island. Now there is a bridge connecting the island to Ernakulam. Kochi offers enchanting backwater boat cruises and is a shoppers paradise in her own right.